Binham is a small and friendly village surrounded by fields of arable and dairy farming, with many fine flint cottages, houses and farmhouses. It is situated between Wells-next-the-Sea and Holt. If walking is what you enjoy, there are many footpaths around the village to explore and practically the entire length of the coast line is accessible. There are several bird sanctuaries along the coast and Pensthorpe nature reserve where the BBC filmed Springwatch last year is just down the road. It is also possible to take trips from Blakeney and Morston to sea the seals and birdlife on the coast. It wouldn't be a trip to North Norfolk without exploring one or all of the great beaches. A few of my favourites being Brancaster, Wells and Holkham. With miles of beautiful sand, whether you are looking to entertain the kids, walk the dogs or just enjoy a romantic stroll you can't leave without feeling the sand between your toes. There is ample opportunity to sail, and if you wanted to bring your own boat then we would be able to store it in a secure barn on the farm. The villages crowning glory is the Priory Church, founded in 1091 as a Benedictine Priory. The nave of the priory still stands as the Parish Church and is lovingly cared for. It is approached through the medieval gatehouse and stands surrounded by its churchyard on the north and west and its extensive monastic ruins to the east and south. Many of the cottages in the village were built using stones from the ruins. The particularly fine acoustics of the church attracts musicians of high repute. The Chequers Inn is a popular 17th Century traditional pub, just a short stroll from Pebble Cottage. They serve a wide selection of fresh food and drink, seven days a week, which is carefully selected from the best local suppliers. Everyone is welcome (including your dog! ), you can sit inside by the fire in winter or outside in our garden in the summer. Howells super store is a corner shop in the old tradition. It is very conveniently situated 10 minutes walk away from Pebble Cottage, right in the centre of the village. You can buy all your supplies here, from milk and newspapers to paintbrushes and bicycle pumps. 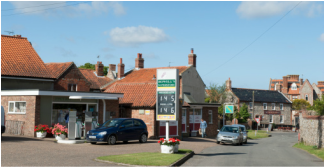 It also also one of the very few village shops in North Norfolk that still provides petrol and diesel. 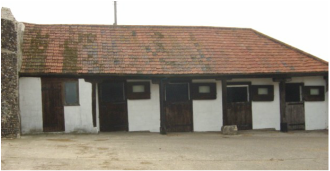 We are able to supply stabling in the village if you would like to bring your own horse.